When I started cooking regularly on the Kamado Grill, it was about one thing — Flavor. Having grown up cooking on gas grills, I am accustomed to how grilling food makes meat, vegetables, and even desserts taste wonderfully different than using the stovetop or oven. But it was a charcoal grill I purchased at a yard sale that made me fall in love with the flavor hardwood lump charcoal adds to grilled dishes. Bags of hardwood lump charcoal can be found at most major hardware stores, but chances are unless you really looked for it, you probably have never noticed them when looking for briquettes. Hardwood lump charcoal is the predominant fuel source for cooking on Kamado grills and the pieces resemble the remnants from a campfire, varying in size from a golf ball to a grapefruit. I bought that cheap, yard sale charcoal grill specifically to try out hardwood lump charcoal and became immediately hooked on the flavor it gave my dishes, and then stuck around for the compliments. Once I fell in love with the flavor charcoal brought to the dinner table, it was time to research the types of charcoal grills available and opt in to a more permanent cooker than what I was using. I found that second-hand charcoal grills – although affordable at a yard sale – often had broken components like a poorly fitting lid, missing handle, or the worst and most common problem, a wobbly base. The ones at my local hardware store did have new parts, but they seemed quite expensive for what I was getting. With a wooden outdoor deck and cook space, I decided that if I was going to spend the money, something more stable, durable, and safe was in my best interests. The Kamado grill was a natural progression. Kamado grills are heavy. Small ones can be about 80 pounds and really big ones can go over 500 pounds. They almost always are offered with some kind of a holder or nest to set the grill into, designed to safely carry the load and move the grill with relative ease. Be sure to take this into consideration when selecting a Kamado grill. Although Kamado grills vary from manufacturer to manufacturer, they all have a few similar things in common. 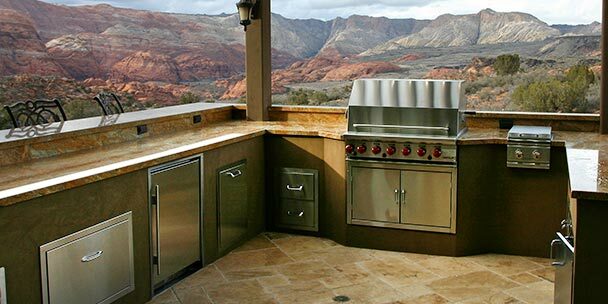 Kamado grills have much thicker walls and retain heat more efficiently and effectively than other grills. 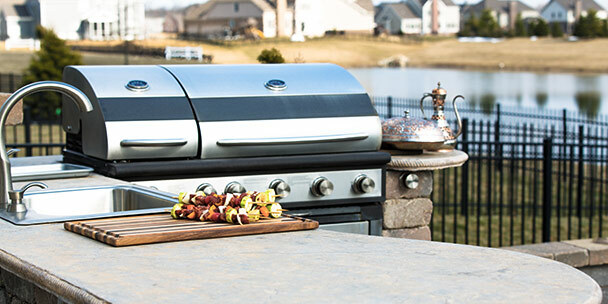 Air enters the Kamado grill through an area on the bottom of the grill, passes by the charcoal fuel source, and leaves out the top – similar to a wood stove. Temperature is regulated and controlled by the amount of air you allow in and out of the Kamado grill. Once pre-heated, Kamado grills are very stable and can cook at low or high temperatures for as long as the grill has charcoal and oxygen. Kamado grills are durable and often made from ceramic compounds. They can sit outside year round with little maintenance. Direct cooking is the most common way of cooking on all grills. Food goes directly on the grill grate, directly over the heat source. This method is particularly effective when cooking items that have a short cook time, like burgers, tender vegetables, and thin-cut chops. Direct cooking is hot and fast and typically takes 4-6 minutes to complete. Direct cooking typically takes place between 375-450°F. Indirect cooking on a Kamado grill uses a protective, internal heat barrier that will diffuse the direct heat from the charcoal. A heat deflector is typically made from the same material your Kamado is, and is round or curved, based on the design of your grill. It is intended to maintain airflow so temperature can be regulated and is typically close to an inch thick. Indirect cooking on a Kamado creates more of a charcoal fired oven environment where temperatures can range from about 200°F for slower, long cooks like ribs, brisket, and pork butts, to 650°F for cooking pizzas or flatbread extremely quickly and at higher temperatures. Indirect cooking is perfect for making a quiche for brunch or roasting holiday turkey. Cooking over raised, direct heat on a Kamado grill is one of the most under-utilized methods. With direct cooking, the food is cooked directly over the coals about three inches from the fire ideal for cooking very hot and very fast. But with raised direct cooking, the food is elevated 8 to 10 inches from the fire for a less violent delivery of heat that allows your food to cook slower and develop additional nuances of flavor. By creating an increased distance from the charcoal, it’s a much less violent heat than cooking direct. The food also benefits from the heat radiating off of the dome. This is an ideal method for beef roasts like the tenderloin or tri-tip, which benefit from slowly coming to their desired doneness. Larger cuts of meat will continue to cook when off the heat. Temperatures can increase or carry over by 12-15°F quickly, going from medium rare to medium well done when cooked quickly over direct heat. But with raised direct cooking, by slowly bringing the roast to your desired temperature, you have less of a carry over and a better chance of achieving your desired doneness. Raised direct cooking is also a fantastic way to achieve crispy, crunchy skin on chicken, without cooking out all of its juices. The Kamado works great as a smoker in concert with slow and low cooking. Slow and low, or slow cooking over lower temperatures, is typically done at 225°F and takes place over 5 to 15 hours of cooking. Wood chips or chunks can optionally be added to a slow and low cook by placing them in and around the charcoal to smolder during the cooking process. Foods which benefit most from slow and low cooking come from hard working parts of the animal like shoulders, ribs, or muscles which connect to major bones. The connective tissues and collagens slowly melt away during the slow cooking process, leaving behind meat that is tender and juicy with intensified flavors. Slow and low cooking is the basis of traditional barbecue cooking and is well worth the wait. Many of the methods for cooking on a Kamado grill can be achieved on other gas and charcoal grills, but in my opinion, the Kamado is the ultimate cooker that checks all of the boxes. If you doubt how much more flavorful a Kamado grill is over other cooking methods, ask someone who has one. I am sure you will get a very detailed response.